Now that our son is back in school and we just have to finalize our lease on a house, Bali is starting to feel like home. We’re still staying at the hotel which is a luxurious treat but not that easy with kids so we try and have some meals outside the hotel to get away from daily room service and being in the villa all the time. 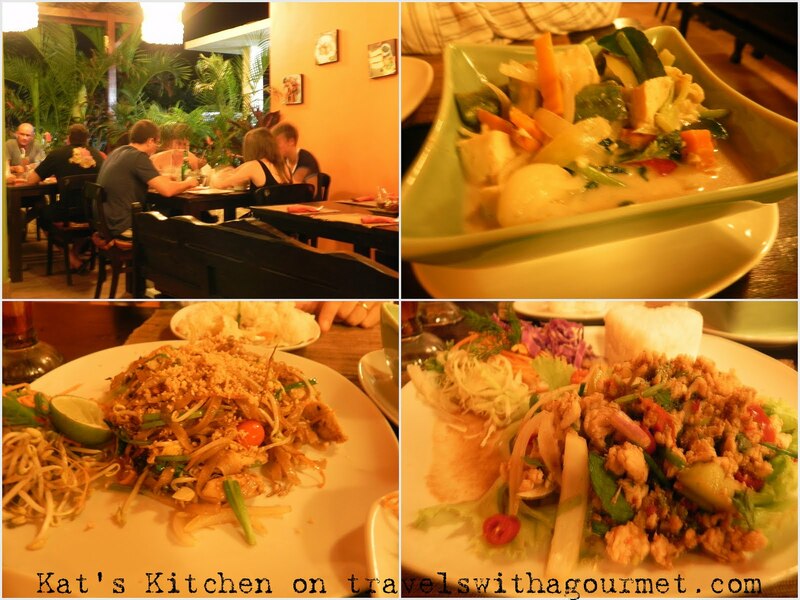 Down the road from Uluwatu in nearby Ungasan is a place we drive by all the time called Kat’s Kitchen which has a large brightly-lit sign right on the road advertizing Thai fusion cuisine. We finally stopped by last week for a quick dinner and we’ve been back a few times since the food is good, the service friendly and the prices very reasonable. The place looks unassuming from outside and the parking lot is seemingly empty until one walks in and see that the restaurant is actually quite full with surfers and beachcombers who have come on their motorbikes. We had several main courses to share – a delicious Pad Thai with chicken, a spicy-sweet-lime flavored Laarb gai (minced chicken salad), crispy pork ribs and a green curry of vegetables with lots of steamed rice (all for around 168,000 Rupiah or US$ 18.50). On another evening, we brought our son along and had the usual pork ribs and Pad Thai but also tried the prawn spring rolls and the red curry of aubergines. The food comes quick and the portions are large enough to share – perfect for a cheap and cheerful meal. Open daily from 8:30 a.m. to 11:00 p.m.